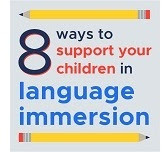 There are many ways families can support a child's language learning at home, including reading with them and encouraging curiosity. Download this infographic in English or Spanish to encourage family engagement and to send home with students! I was thinking of you yesterday and wanted to share this story with you. Byron and Nora started playing travel soccer this fall. Yesterday Nora's South County played a team from Providence -- all of the girls on the team spoke Spanish. At the end of the game they give high-5s and thank the other team for coming. Nora said in Spanish, "I hope you liked the soccer game." and some of the girls said the same thing back. You are opening the world to them, Sol -- thank you!! !